We all want an excuse to relax and unwind during the week, so we decided to start “Working Women Wednesdays” for all our hard-working ladies. These nights are to be super casual and the perfect midweek girls’ night outs. Come as you are and bring your friends and coworkers (or just yourself!) to relax, unwind with us and enjoy some wine and cheese. We just love an excuse for a party! Several of you commented on the great music at our last Pink Party in October, and we are excited that Mickie will be back on Wednesdays to set the mood. Also, if you wish to shop, the entire store will be 20% off for the night. 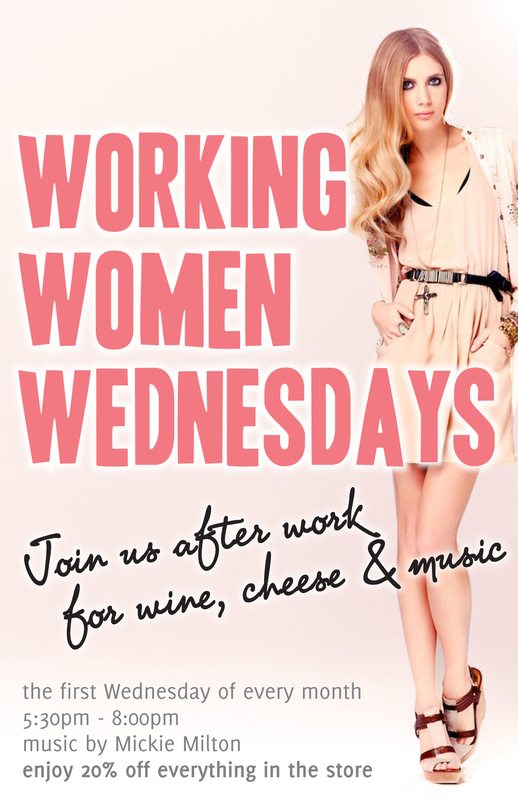 Join us after work the first Wednesday of every month for a glass of wine, some cheese, great music and special discounts. Tell all your friends and coworkers. Make this your girls’ night out! We are excited and can’t wait to see you there. Mark your calendars. The first one is next Wednesday, April 6th!